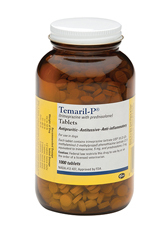 Temaril-P is a medicine which contains a blend of the antihistamine trimeprazine and the corticosteroid prednisolone. It’s believed that when the two ingredients are combined less prednisolone is needed to control symptoms of itching than if the dog was given prednisolone by itself. Temaril-P could be useful for the treatment of both itching conditions and coughing in dogs, but should only be given at the lowest dose and shortest duration possible to avoid Cushing’s syndrome. Where can I learn more about prednisolone? To learn more about this corticosteroid please see . Note: Never begin giving this medicine to your dog without veterinary approval to do so. Each Temaril-P tablet contains 5 mg of trimeprazine which is useful for reducing symptoms of itching (regardless of the cause) and 2 mg of prednisolone which can be used for its anti-inflammatory effects. When you first begin treating your dog an “initial dose” will be used for 4 days. The recommended initial dose can be found in the table below though you should always follow your vet’s recommendations. After treating your pet with the above dosage for 4 days you should try cutting the dose in half. For example a dog weighing 21 – 40 lbs would be given 1 tablet every 12 hours. This can be adjusted until you find the lowest dosage that relieves your dog’s symptoms. When treating itching conditions you can also try giving an Omega-3 supplement. This can help to lower the required dose of medicine. Example Dosage: A 50 lb dog would be started on an initial dosage of 3 tablets every 12 hours for 4 days, and then 1 and a half tablets (or as little as required) every 12 hours from then onwards. Overall the medicine is safe for most dogs when used correctly, though it is not suitable for those under 6 months or those who are pregnant. When treating dogs with infections they will also need to be given an anti-infective medicine. Prednisolone lowers the body’s immune response which can make it dangerous for those with serious infections. Could it damage the liver? Because it contains prednisolone it should not be as harsh on the liver as prednisone. Watch closely for adverse reactions, if any seem worrisome contact your vet for advice. It is not used to control coughing caused by heart conditions. For further complications associated with prednisolone .